Rubeus Hagrid might look pretty scary, but looks are often deceiving! Take a look at oatmeal for instance. It looks like a horrid mess of inedible slop, but it actually hits the spot quite nicely in the morning. Yeah, that’s it! Hagrid is a little bit like oatmeal. He might not be the handsomest dish around, but he certainly is a mainstay at Hogwarts! …okay, maybe that might not quite be the best analogy, but you get the picture. The lovable big lug is one of our favorite characters, from his big rugged beard down to his giant-sized feet (half-giant, really). He spends most his time worrying about his friends and family and we also hear he’s a pretty decent cook (Mmm! Mmm! Rock cakes!). 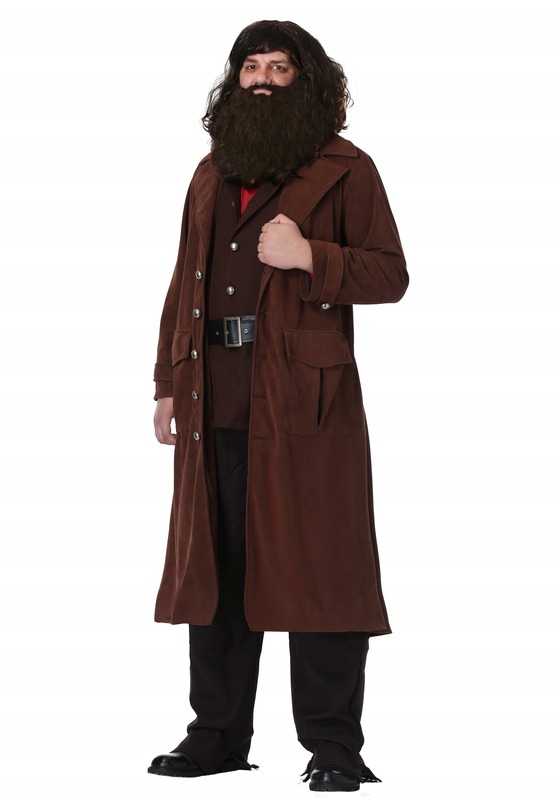 That’s why we’re really excited about this adult deluxe Hagrid costume, which is officially licensed from the Harry Potter films. The costume comes with everything you need to become Hagrid (aside from the heart of gold, which you will have to provide). The large brown coat has two front pockets, perfect for storing moldy dog biscuits for Fang or whatever you like to call your favorite canine friend. The coat also has an attached vest with a full button front to give you a realistic look from the movie. Make sure you start cultivating your beard now, since you’re going to need a pretty grisly one in order to portray the legendary groundskeeper at Hogwarts.